Happy Wednesday, all! I am happy to be hosting Carly from Carly Blogs Here on MITM today. Carly was one of the first bloggers I met here in the blogosphere, and her blog quickly became one of my favorites. She writes about everything from beauty to style to recipes, and she recently started a Washington, D.C. travel guide to give her readers insight on where to go and what to see while visiting her home state. 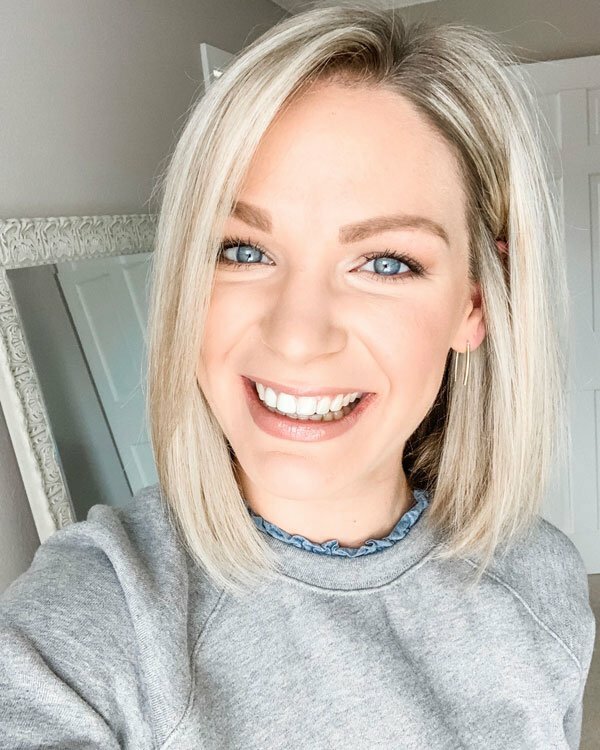 Today, Carly is sharing some of her can’t-live-without beauty products. 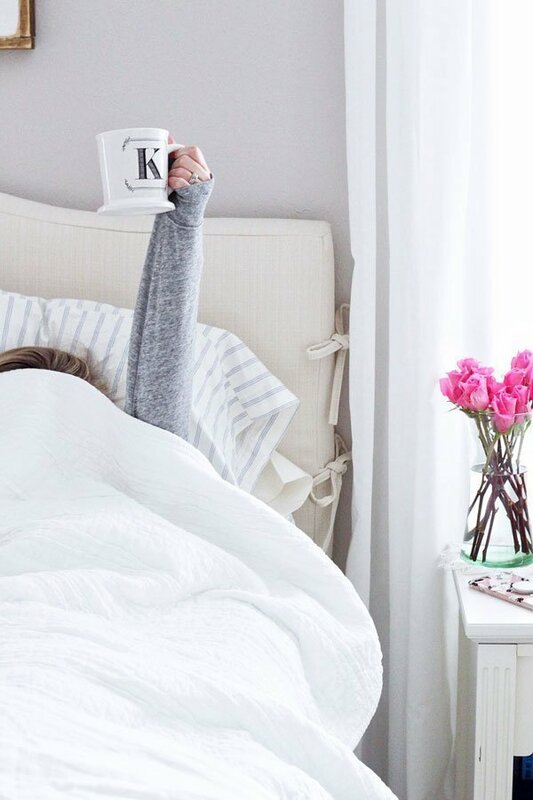 Enjoy, and be sure to check out her blog for more! I’m so excited to share this post on Karly’s blog today because these are basically my favorite products of all time—or the products I always repurchase as soon as I run out. If you’re into reading beauty blogs you know how easy it is to get wrapped up in always wanting to try the newest or most hyped up products, but these are some of my holy grail staples that I just don’t see myself parting with anytime soon! Lancôme Mascaras: If you’ve read my blog at all you already know this is the only mascara brand I wear. The Hypnôse formula is probably my all time favorite– it gives an insane amount of volume while also defining the lashes. I’m currently using Definicils, which is a little less dramatic but really lengthens my lashes. These mascaras don’t smudge or flake or smear + they don’t require you to use half a bottle of eye-makeup remover to take off at the end of the day. If you don’t mind spending a little extra money on a mascara these are definitely worth a try! Pixi Brilliance Balm in Unique Pink: This is one of those products that adjusts based on the pH balance of your body. My lips lack pigmentation so this is perfect for me to put on to get a little bit of color. It’s also extremely hydrating and moisturizing on the lips, which is an added bonus. Lemon & Pomegranate Lip Cream: This is another lip product that is heavenly on the lips. It doesn’t add any color but it feels extremely soft without being the slightest bit heavy or sticky & the scent is amazing. On-the-Spot Acne Treatment: This definitely isn’t a glamorous product but it is by far the best acne spot treatment I’ve tried. I get the unfortunate hormonal spot or two around my chin and this really works at treating the area. It has 2.5% benzoyl peroxide, which is just enough to make a difference without totally drying out your skin. I’ve tried numerous high-end products that make the same claims and they don’t stand a chance to this little $6 tube! Frederic Fekkai Brilliant Glossing Conditioner: This conditioner is an all around winner- when I use it I can’t stop touching my hair. It’s lightweight and it makes my hair soft & shiny like no other conditioner I’ve ever used (I have long, straight, slightly fine hair). I will admit that it’s on the expensive side for a pretty small bottle—because of that I ration it out and only use it on days I know I’m planning to wear my hair down. EOS Lip Balm: I’m sure most everyone has heard of these lip balms by now, but this is another lip product I love and have with me at all times. The honeysuckle is my favorite scent! Sally Hansen Insta-Dri: I can’t even tell you how many bottles of this I’ve gone through! If you’re someone who paints your own nails often and you don’t have a lot of patience to let them dry- give this a try! This is under $5 and worth every penny! Too-Faced Shadow Insurance: There are quite a few different shadow primers on the market and I haven’t tried them all, but this is one of those products that works so well I don’t think I need to venture out (I have tried urban decay’s primer potion & definitely prefer this!). I have oily lids—especially in the summer so a primer is a must if I’m going to wear any kind of eye shadow. While this is $20, a little bit goes a long way and a tube will last you quite a while. 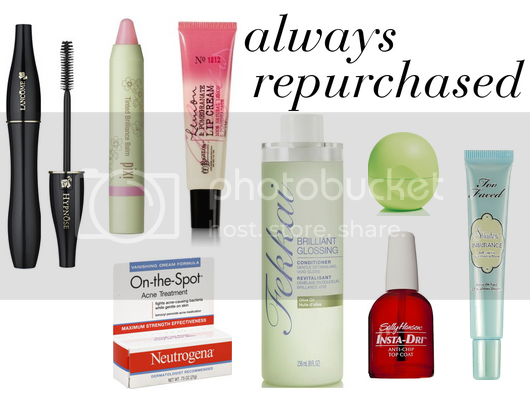 Let me know, what are some of the products you always repurchase? A huge thank you to Karly for letting me post here today! Make sure you stop by my blog, Carly Blogs Here, for more beauty related posts! It's so good! It used to always be sold out at my b&bw so I would stock up on them & it's definitely worth it. You definitely need it with your lip crayon obsession! haha The two I have are less pigmented than the revlon or cover girl ones I've tried but more moisturizing and feel a tad bit bitter on the lips & certain shades are stains, which is nice. The Pixi balm is amazing! It's one of those products you can wear to get a little color but it doesn't really look like you're wearing lipstick or anything crazy. Good for no makeup days. It's so good! And even better when you can get it somewhere when Sally Hansen is having a sale! Yesss! Definitely try out the mascara– you won't be disappointed 🙂 The shadow insurance isn't as fun but equally important and the tube really does last a really long time! there goes my bank account, lol. i need to try that mascara (or any of theirs) and that shadow primer stuff. I need to try the Pixi balm and that lemon pomegranate lip cream sounds amazing! I mix up my makeup a lot but I'm pretty set in my ways when it comes to skin care – I always repurchase the same moisturizers, cleansers and toner! i used to love that lemon & pom lip gloss. ooh maybe i will try that insta-dri bc i cannot find a top coat i like. thank you for this list! ESOS is the best! Safe for dog consumption too! Trust me it's happened one too many times! I've always heard great things about Lancôme mascaras! I JUST replied to your comment about the PIxi brilliance balms! My Target had testers of these the last time I checked, so I'll have to play around with them. The TFSI is one of my staples, too! EOS lip balm is the best! I need to pickup that Pixi stick… I love that it's hydrating too. I always repurchase the Shadow Insurance and EOS too 😉 That Lemon & Pomegranate lip cream sounds amazing! It's definitely one of those hair products that when I use it, I can't stop touching my hair because it's so soft. so many of these i LOVE. i'm here carly's blog! Lancome has some of the best mascara out there!! Thanks for the review on the conditioner – you have beautiful hair so it's good to know your secret haha!